FAQ stands for Frequently Asked Questions, and an FAQ page on your website is an organized collection of valuable information that your customers ask about your products and services. Your FAQ page deals with specific questions about your business and you can leverage professional freelance copywriting to reach your target audience. Your FAQ page is a section of your website will become a go-to destination for your customers. This page is one of the most overlooked pages for many small business websites, but in reality, this page is one of the most important the help you increase your online presence and drive qualified traffic to your site. 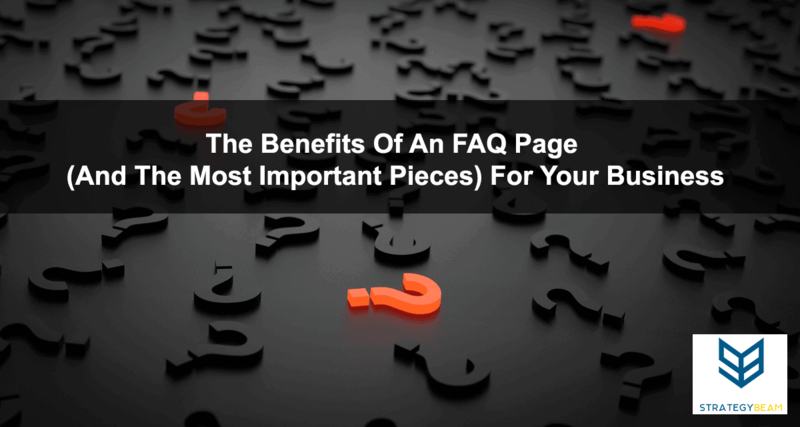 Why Is An FAQ Page Important For Your Website? A great FAQ page is one of the most important elements of your business website. While your company needs to have great content and a clean architecture to provide a great user experience. Your site FAQ section will draw most of your traffic and convert more customers. FAQ pages are an integral part of good navigation and the customer journey for most websites. This section of your site is the go-to area for your audience who want to learn more about your business and find out why your products and services are what they want. Whenever someone clicks on the FAQ page you know, they in your business.For many people, the website FAQ page is the second page they go to after the Home or Services pages. Instead of guessing what topics you should cover, you can use several online marketing tools for small business to help you understand the needs of your customers. This is a great way to optimize your FAQ page before spending a lot of time or resources on the task. For many people, the website FAQ page is the second page they go to after the Home or Services pages. Your FAQ section needs to include high-quality content that will help your customers understand your products and services quickly. This means that your FAQ page can play a central role in driving your audience to paying customers. It is a good idea to invest in high-quality content for your FAQ page to ensure that your content converts and helps your business reach your goals. Along with the technical questions and answers, your FAQ section will establish you as an authority in your industry. The FAQ page shows that you know so much about your products and services that you can answer questions before they are even asked! You can also use your FAQ page as a form of social proof because your business can establish your website as a valuable asset to drive sales. Finally, your website FAQ page will reduce a lot of stress from your customer service department. Instead of fielding a large volume of accessible to answer questions. Your business should promote your FAQ page to your clients as their go-to source of information about your business. Along with being a central location of your website, your visitors will go to your FAQ page if they want to learn more about your products and offerings. Since your FAQ section will be the highlight of your website, you should link to product pages from the FAQ page. This will help your internal linking strategy and spread the benefits of a great SEO strategy to other areas of your website. If you want to increase the usability of your site, improve your business authority, and increase conversions, then you need to have an excellent FAQ section. Think of your FAQ page as the main hub that your customers can go to with their questions. One of the strongest reasons to have a FAQ section is to address the needs of your readers. Since your customers that they want more information about your products and services by going to your FAQ page. You should provide high-quality content about your business on the FAQ page. The best thing you can do to overcome objections and increase sales is to provide accurate information to address questions your customers might be asking. Instead of allowing uncertainty to prevent a sale, you can use their items as fuel to establish your business as an industry leader and drive more conversions. Whenever you ask someone a question, you are seeking their advice because you view them as experts This same thing occurs when your customers ask you questions about your product and services. Since your customers want to know information about issues that your business knows about, you can use your FAQ section as a way to establish your business as a trusted expert. Whenever your audience asks you questions about your business, you can establish yourself as an expert by answering their questions with great information. Your competition is working to draw your customers to them, so you should do everything you can to establish yourself as a trusted expert. Providing excellent answers to the questions your customers are asking is the best way for you to be a reliable source. Use your FAQ section to help your business earn the trust of your customers. You can use your FAQ section as a first touch point with your customers where you can direct your customers to begin the relationship that will convert them to paying customers. If your business has an optimized FAQ section on your website, then you will see an increase in conversions since the percentage of visitors on your website will buy your products and services. However, having an FAQ page with miscellaneous information won’t do the trick. Your FAQ page needs to be tailored to the specific needs of your customers. In addition to having focused content, you should have links from your FAQ page to your product pages and online shop. More advanced tactics for a FAQ page is to compare your products and services to those of your competition. This will give you a natural way to show the advantages of your business compared to your competition. Search engines love FAQ pages because they provide relevant content to help Google understand your business. This means that you need lots of good content to help your business get found in search engines. Your website’s FAQ page is the perfect place to publish lots of interesting information about your business, products, and services. You can also leverage your FAQ page to include long-tail keywords that your customers are searching for. Since you are already providing information about your business, you can add keyword-rich content so when someone searches for your products and services they will find your FAQ page. The questions and answers you include on your FAQ page will on the user personas that you have to build to represent your customers. As you continue to develop more answers for this section, you will find this page will rank high in search engines. This is why you should include specific and detailed questions on your FAQ page. This section should contain relevant information about your business so you can get picked up in search engines like Google and Bing. To write a great FAQ page, you will need to know what your customers are asking most often. You should think about whether your clients ask about individual features and unsure about some technical aspects of your products and services. If your clients ask about your features, then you can provide accurate answers in your FAQ section and build out that information on the product pages. Your FAQ page should complement information that exists elsewhere on your site. This approach will help your website rank for that information, and save you time producing the FAQ page since the content exists on your product pages. Since your visitors will be consuming your content on different devices and in specific ways you need to create your FAQ section to be displayed in various forms. Here are some ideas to help you write compelling FAQ content that can also be scanned and answers found. Put yourself in your customer’s shoes to figure out what questions or problems they might experience. Provide in-depth and valuable solutions to these issues. Your answers to the FAQs should be informative to give insight about your business, the products and services, and always point back to benefits and value. Be concise enough to offer information that is necessary but doesn’t be too wordy because you don’t want to lose your customers as they are asking questions about your company. Format your content for easy consumption as needed. Your content should be easy to scan. You can use bullet points and short paragraphs to help your readers consume your content. Be sure to double check your information. Your FAQ sections need to be accurate especially if you are writing about technical topics. Organize your questions and answers in similar groups. Your customers want to find answers. Many businesses bury their FAQ section at the bottom of their website, and this makes it difficult to for your customers to find. If your audience can’t find your FAQ page, then they can’t find the answers they want to make a sale from your website. Since the FAQ page is also an excellent way to rank in search engines your business needs to ensure you use long-tail keywords and real-life questions to draw qualified leads. Not only will this help Google find your content, but it will also establish you as a leader in your industry. This new level of trust will contribute to drive your audience towards a purchase and help you reach your sales goals! If you are ready to drive more online sales with a professional website copywriter, then shoot me an email today! I will work with you to understand your audience and write compelling copy that will get your business more online sales!